On April 27 each year, the citizens of Mayotte celebrate Abolition Day. It is a public holiday that commemorates the abolition of slavery in Mayotte in 1847. Mayotte is an overseas department and region of France located in the northern Mozambique channel. The first Europeans to set foot on the archipelago were the Portuguese in 1503, but they did not colonize it. Mayotte became a French colony in 1841. However, slavery had existed in Mayotte long before then. In 1500, the Mawuti or Maore Sultanate was established on the island. Slavery was widely practiced in the early Islamic states. However, according to Sharia, slaves were treated as human beings in a paternalistic fashion. They possessed some rights and played a wide range of economic and social roles. When Mayotte was ceded to France, about half of its population was slave. The French hoped to develop the colony as a port, but that was impossible while Muslim domestic slavery existed on the island. In April 1847, the French chambers officially abolished slavery in Mayotte. The anniversary of this event is celebrated as a public holiday, although the liberation process began only several months later. 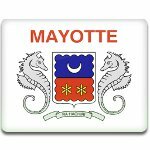 Mayotte was the first French colony to abolish slavery. Slavery in all of the French colonies was abolished in 1848.